England are in action tonight, but it’s not the World Cup and the international break has come just as the Premier League season got going and no one even knows what the Nations League is and just bring back the club football please? To keep us all sane as we await the return of Liverpool, Manchester United, Arsenal and co., we’ve put together a little list of the statistically highest-rated player at each big six club so far this season. 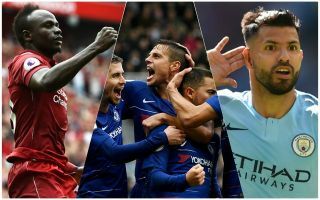 We scanned the excellent WhoScored to get our answers, and found one or two surprises – but then, that’s always a bit more likely after just four matches. Here is the best performer at each top six side so far – which of these will still be there by the end of the season? Scorer of United’s winning goal against Leicester City, Luke Shaw has had a fine start to the season, looking one of his team’s best players in what has been a difficult period. The 23-year-old’s displays have earned him a place back in the England squad, and MUFC fans and neutrals alike will be delighted to see him getting back to his best after his Old Trafford injury hell. Shaw has an overall rating of 7.27 for the season so far, with most other United players under-performing in the first few matches. At Liverpool, it’s not surprising to see the in-form Sadio Mane top the list after his four goals so far, with a WhoScored rating of 8. The Senegal international might not always get the same attention as Mohamed Salah or even Roberto Firmino up front, but he’s just as important to Jurgen Klopp’s side. Undoubtedly one of the most improved players in the Premier League in recent times, it’s nice to see Mane top the Liverpool rankings so far. With a score of 7.84, Eden Hazard has two goals and two assists already for Chelsea despite not starting straight away due to making it to the World Cup semi-finals with Belgium in the summer. The 27-year-old looks right at home under new Chelsea manager Maurizio Sarri, and has done very well to get in ahead of hugely impressive summer signing Jorginho, who has probably looked the most stand-out player for CFC on the pitch so far. The Blues have won all four of their first four games and will hope this fine run can continue as Hazard really gets into his groove. With one goal against Cardiff City, Shkodran Mustafi may have helped his WhoScored ratings a little. The German defender isn’t always Arsenal’s most reliable performer, but he comes first here for the Gunners with a rating of 7.21. That’s not especially high, so it perhaps says more about his team-mates than it does about him. With a rating of 7.91, it’s been another great start by Manchester City striker Sergio Aguero this season. The Argentine hot-shot has already helped himself to three goals and one assist, despite City not quite enjoying a perfect start due to their draw with Wolves. If Aguero carries on like this, however, he’s likely to have another influential season as City look to retain their title. One of England’s heroes over the summer at the World Cup, Kieran Trippier is also continuing his remarkable rise at Tottenham. Rated their best player with a WhoScored rating of 7.64 so far, Trippier has contributed one goal and one assist from right-back. Spurs will likely see the likes of Harry Kane and Dele Alli climb the rankings as the season goes on, but Trippier is another of their most important players. Which of these has impressed you most?